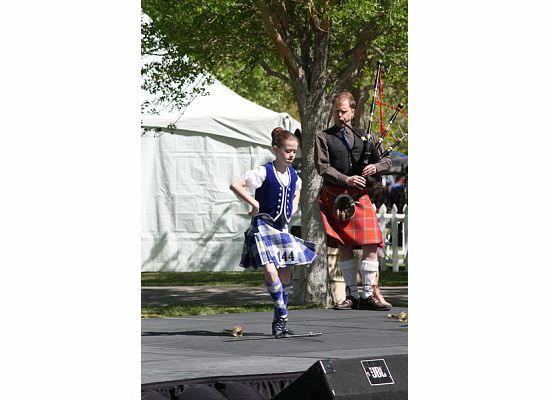 Highland dancing covers a number of different dance steps, including what are termed "national dances", based on traditional dances from Scotland that have been standardized by an international body, the SOBHD. 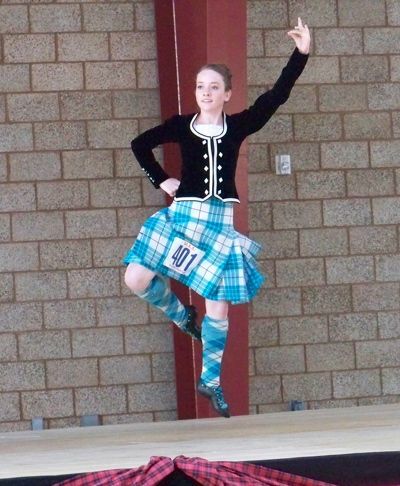 The ones learnt by most students of highland dancing are the fling, the sword, the Seann Triubhas, the lilt, the flora, the hornpipe and the jig, among others. Most such dances are solitary affairs, although occasionally the highland reel and Strathspey -- involving four dancers at a time -- can be seen being performed at dance competitions by more senior dancers. The most familiar of these dances is probably the Highland Fling, and is usually danced to 32 bars of a lively Strathspey. 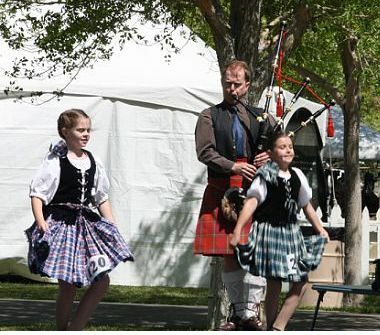 Popular tunes for this step are the "Marquis of Huntly Highland Fling" or combinations of shorter Strathspeys like "Devil in the Kitchen" and "Orange and Blue". The dance is an athletic one, and is celebratory. Folklore has it that it would have been danced as a victory dance after battle atop the shield (with central spike) of a successful combatant (most highland dances were traditionally performed by men; in more modern times, the balance has swung to women). Another dance likely recognizable to most is the sword dance. This is performed to a two part Strathspey -- usually to the tune "Gillie Callum" -- where the tune begins slowly as a dancer negotiates the area outside a pair of crossed swords laying on the ground. 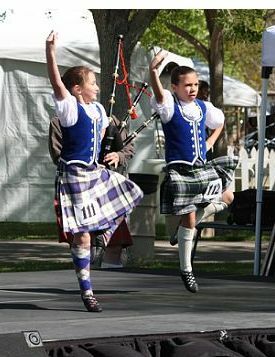 At one point in the dance, the dancer claps hands to signal to the piper to pick up the tempo at which point the dancer performs delicate footwork near the point where swords cross. According to lore, the sword dance would have been performed prior to battle, and touching the swords during the dance (apart from being a potentially bloody affair) would have been taken as an ill omen of the looming battle's outcome. 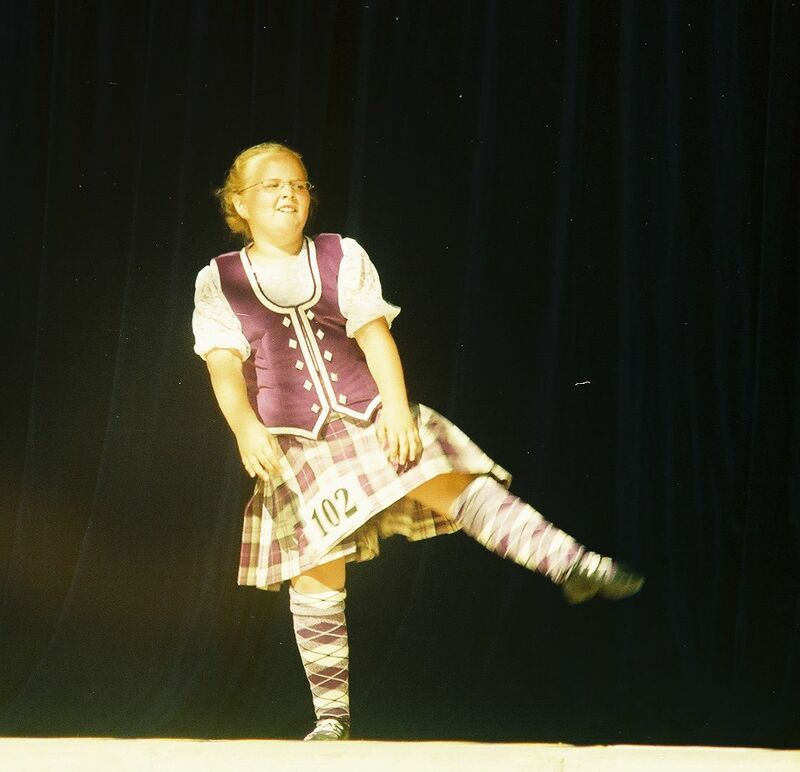 When younger dancers are learning the sword dance, they often do so in stages, first learning a step called the "pas de basque" (pronounced "pah-dee-bah") and then a more involved form with an embellishment called "high cuts". The Seann Triubhas (that's Gaelic and isn't pronounced anything like it's spelt; if you say "shon-trooz" you'll be close) is a dance that celebrates the return of the wearing of the kilt and like the previously mentioned pair of dances, is performed in highland regalia, and to the tune "Whistle O'er the Lave O't". Following the defeat of supporters of "Bonnie Prince Charlie" in 1746 at Culloden near Inverness, the British government banned the playing of bagpipes and the wearing of the kilt, only to rescind the ban decades later (some would say that a mistake was made concerning bagpipes). The movements in the dance evoke the shedding of the trousers in favor of the kilt, with the dance concluding to a peppy Strathspey from its more stately beginning. More balletic dances are also performed by students of highland dancing, termed "national dances", two of which are the lilt and the flora. 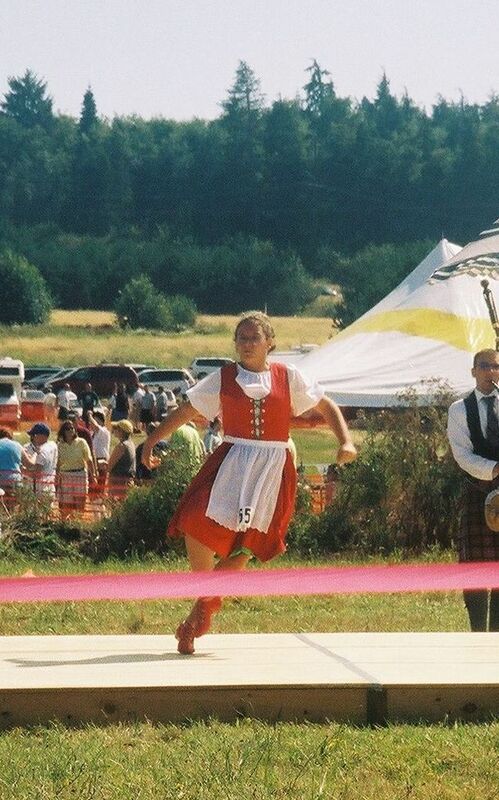 These dances are performed in more feminine costume, often simple white dresses with tartan sashes, and are less athletic than the highland dances. The (Scottish) lilt is danced to a slip jig (or 9/8 march), usually the pipe tune "The Battle of the Somme", and the flora -- more properly Flora MacDonald's Fancy -- is usually performed to the more energetic tune "The Glendaruel Highlanders". The Flora MacDonald whose name is lent to the dance is also of "Bonnie Prince Charlie" fame: folklore has it that Flora MacDonald hid the fleeing Bonnie Prince beneath her skirt as she rowed to the Isle of Skye from where the defeated pretender to the throne fled for continental Europe. 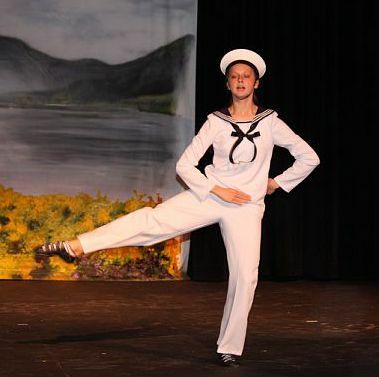 The Jig and the Hornpipe are examples of "parody" dances, and in a competition, a dancer must wear a separate costume for each dance. 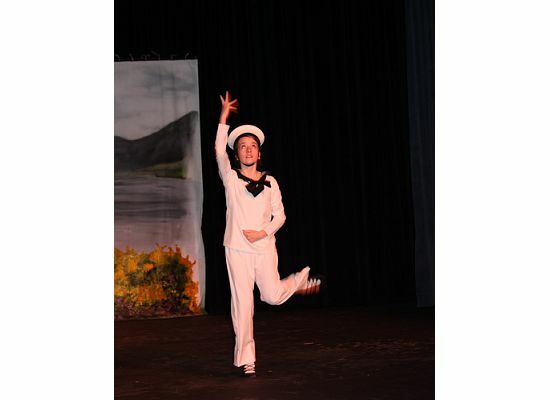 In the case of the hornpipe, the dancer is kitted out in a sailor's uniform and the dance performed mimics the movements expected of a sailor of yore in doing his shipboard chores. The (Irish) jig, often performed to the tune "The Irish Washerwoman", has a dancer portraying an angry wife, whose movements menace an imaginary, wayward husband. A different account has it that a washerwoman is being tormented by a mischievous leprechaun. Both dances are fast paced and challenging to perform, and are seldom learnt by beginning dancers.